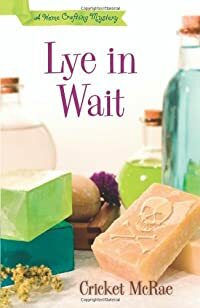 Lye in Wait by Cricket McRae, a Mysterious Review. It is entertaining to follow Sophie Mae as she becomes an amateur sleuth. She's not above being a bit boorish if it furthers her investigation. She discovers that Walter had recently come into some money, always a motive for murder. The suspects are numerous and include Walter's ex-wife, his fiancé's brother, and even Meghan's ex-husband. All cozies need the gruff but loveable detective, and true to form there's Detective Ambrose who's always on hand to remind Sophie Mae that murder investigations are best left to professionals. Special thanks to guest reviewer Betty of The Betz Review for contributing her review of Lye in Wait. Acknowledgment: Midnight Ink provided a copy of Lye in Wait for this review.